This is game 2 from the 1st MLily Cup final. 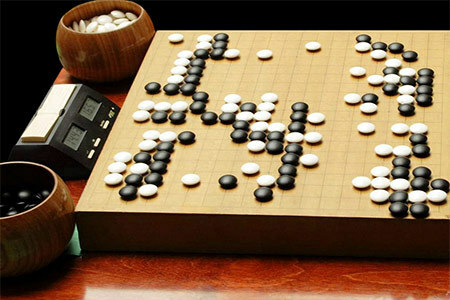 The game was played between Gu Li 9p and Mi Yuting 4p on December 2, 2013, in Jiangsu, China. Gu Li won game 1 of the final, so if Gu wins this game again, it’d be an easy series for him in the best of five. Gu Li 9 dan (left) and Mi Yuting 4 dan, at the 1st MLily Cup final. Gu Li was ranked #3 in China by the time of this final, and he’s still one of the most popular players along with Lee Sedol 9p in the world these days. Gu Li 9 dan at game 2 from 1st MLily Cup final. His style of play is quite unique. His opening is outstanding, and he often played creative moves which soon become popular for other pros. His haengma is strong and firm, and his power in the fighting is destructive. Most of his games are dynamic and thrilling with his brilliant and creative moves, and that’s the main reason why people like to watch his games so much. In this Mlily Cup, he defeated Na Hyun 3p, Hu Yaoyu 9p, Wang Lei 6p, and Zhou Ruiyang 9p to proceeded to the final. Mi Yuting was born in 1996, and he became a pro in 2007. His ranking was #7 in China by the time, but he was yet unknown internationally by then. Mi Yuting 4 dan at game 2 from 1st MLily Cup final. His best results in the international tournaments before this MLily Cup was round of 16. He proceeded to the round of 16 both at the 2012 Samsung Cup and the 4th BC Card Cup in 2012. However, his performance in this MLily Cup was very impressive and sensational. He defeated Lee Sedol 9p, Kang Dongyun 9p, Kong Jie 9p, Dang Yifei 4p and Wang Xi 9p to reach the final. All of his opponents were either world champions or finalists of international tournaments, and Mi defeated them all. He was relatively unknown, but his reading was already propound and accurate especially at the close combat. He’s also got strong mind as well, so he maintained his calm when he was in trouble or behind, although he was only 17 year old boy. Let’s have a look at game 2 of the 1st MLily Cup final. Gu Li 9 dan (left) and Mi Yuting 4 dan, reviewing the game.